The BEARR Trust Annual Lecture 2012, given by Sir Tony Brenton, was given at the European Bank for Reconstruction and Development (EBRD) on 11 June 2012, on the theme “Russia and the Arab Spring”. Tony Longrigg CMG, the Chairman of the BEARR Trust, welcomed the guests and Jonathan Charles, Head of Communications at EBRD, introduced the speaker. Sir Tony said that having worked in both the Arab world and Russia, he would try to identify patterns in international affairs. When he first served in Egypt, it was a state run by a one-man government, with a socialist economy, a ruling party that had never lost an election, controlled media, a rigged justice system, a high level of corruption, and numerous human rights abuses This might sound familiar. After the Second World War the largest undemocratic region apart from the Communist world was the Arab world. It is harder for countries with a lot of oil to be democratic – their wealth allows their leaders to pay off their henchmen. Many people expected Russia to become a European-style democracy after 1991, but 20 years on it has a self-appointed president, an oligarchic layer, widespread corruption and increasing stagnation that even Medvedev commented on during his presidency. Tunisia, the first Arab country to have a revolution in 2011, was followed by Egypt and Libya, and reforms were introduced in Morocco and Yemen. These revolutions were not due to poverty but to inequality. They were possible because it is no longer possible to control the mass media, because of the internet and social media, and mobile phones which spread news fast. The first official reaction in Russia to these events was curiosity, followed by support for the changes because regimes supported by the West were collapsing. But this support did not last: Libya and Syria have both had close links with Russia so the their revolutions were not so popular with the Russian authorities. They began to realise that the events could have implications for Russia. Soon after September 2011, when Putin announced that he would return to the presidency in 2012, he was booed at a martial arts contest – something that had never happened before. In December the elections to the Duma were accompanied by massive electoral fraud, and much of the cheating was recorded on film and uploaded onto the internet. The result was explosions of anger, not only in Moscow and St Petersburg but further afield, even in Vladivostok in the far east. The protests have continued ever since. Since his inauguration in May, Putin has shown he is intent on restoring control, not on establishing democracy. One reason that he has been able to do this so far is that in Russia in the 1990s, when “democracy” arrived, most Russians had a very hard time, many of them losing their jobs and savings. Something similar happened in Algeria in 1991 – they had democratic elections and then everything turned sour. Even today, Arab friends are despondent, in particular at events in Syria, which seems to be approaching civil war. Many of them feel that because they never had democracy in their region, it will not work. But they could be proved wrong, as past events in Latin America, Spain and Portugal show – these countries became democratic. In Russia too, the genie is out of the bottle. The pro-Putin United Russia Party has lost credibility, after being called the “party of crooks and thieves” – a label which went viral on the internet – and other “tame” parties have become less tame, with deputies from Just Russia walking out during Putin’s inaugural speech. Regional elections are being lost by United Russia candidates, and elections of governors will once again be by popular mandate and could be very interesting. Meanwhile, economic growth has slowed to 4%, and the media are less controlled because of the reach of the internet. Putin can’t deal with this the way Assad is doing, but he has had the penalties for demonstrators toughened. It will not, in Sir Tony’s opinion, be possible to keep the lid on Russia. A range of questions were put from the floor – most of them about Russia itself and about Russian policy towards Syria. Sir Tony thought the tipping point for democracy in Russia might be if the oil price falls, or if excessive violence were used by the regime. Young Russians used to be very cynical about politics and as a result few people had anticipated the protests in December. Many young people are also nationalistic – opponents of Putin are not only liberals but from the right wing – but this tendency is declining as people become richer. In general young Russians are patriotic and like order, which they would choose over democracy. But the authorities do not trust civil society since the “Colour Revolutions” in Georgia, Ukraine and Kyrgyzstan, which Putin thought were fomented by the West. On Syria, Sir Tony pointed out that Russia has military assets there, and the Kremlin believes Assad can survive and will want to help him stay in power. But at the same time Russia does not like being out on a limb, so it has supported the Annan Plan. Russia is fearful of a new Libya scenario. The West should try to split China off from Russia over Syria. Russia and China are wary of each other, and still have unresolved territorial issues in Russia’s Far East. Putin has even mentioned a potential security threat from China. Tony Longrigg closed the proceedings by introducing his successor as Chairman of The BEARR Trust, Robert Brinkley. 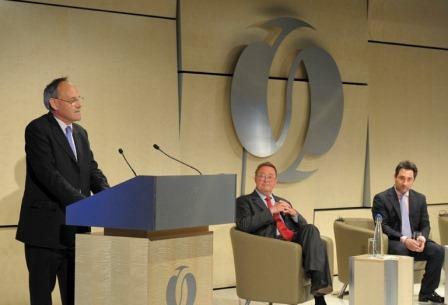 BEARR is, as ever, most grateful to EBRD for hosting and supporting this lecture. Tony Brenton is a distinguished British diplomat, writer on international issues, and Fellow of Cambridge University. He joined the British Diplomatic Service in 1975 and, in the course of a 33 year career, served in the Arab world, the European Union, Russia and the USA. He has dealt with such issues as the Arab/Israel dispute, global climate change, international energy policy, and the Kosovo, Afghanistan and Iraq wars. He was a senior official at the British Embassy in Washington DC following 9/11 and at the time of the Iraq war. He served as British Ambassador in Moscow 2004-2008 during the most difficult period in modern British/Russian relations. He has written a well received book on international environmental diplomacy – “The Greening of Machiavelli”, is a regular commentator in the “Times” and other British publications, a Senior Advisor to Lloyds of London, Director of the Russia British Chamber of Commerce, and a Fellow of Wolfson College Cambridge where he is writing a book on Russia at the time of Peter the Great.